Presentation and Diagnosis of Shoulder Tuberculosis. Department Of Orthopaedics, Dr.D.Y.Patil Medical College, Pimpri, Pune. India. Introduction: Afflictions of shoulder by tuberculosis is rare and when it occurs its more commonly a dry lesion (caries sicca). Wet lesions in shoulder are rare and we report this case for the rarity of its occurrence. Case Report: A 55yrs old female patient presented with a painful swelling with restriction of movements of the right shoulder since six months. Patient had taken various treatments without any relief; there was no history of trauma, weight loss, recent infection in the past or any history of tuberculosis in family or contact with tubercular patient. 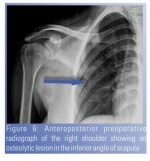 Right shoulder revealed restricted movements with no local rise in temperature. Tenderness was present over anterior and posterior aspect of the right shoulder diffusely. External rotation and abduction movements were restricted while adduction and flexion were not restricted. Power of the muscles was unaffected with no neurological deficit. Antero-posterior and axial X-rays of the right shoulder showed no bony involvement however, ultrasonography showed lipoma. Serological investigations showed a markedly raised erythrocyte sedimentation rate (73mm / hr) and a positive C-reactive protein. 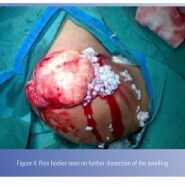 Surgical excision of the mass revealed rice bodies. DNA PCR was positive for tuberculosis and patient was started on anti-tubercular treatment( Category I) for six months. Conclusion: Any patient coming with the complaints of long standing painful restriction of the movements of the shoulder associated with or without complaints swelling, shall be evaluated to rule out skeletal tuberculosis along with other differential diagnosis of periarthritis of shoulder and adhesive capsulitis. Most of the patients with skeletal tuberculosis may not necessarily present with the constitutional symptoms of fever, weight loss, etc and also because of the widespread prevalence of the organism in India. Keywords: Shoulder Tuberculosis, Caries Sicca, rice bodies.